Over the past several decades, many climate datasets have been exchanged directly between the principal climate data centers of the United States (NOAA's National Climatic Data Center (NCDC)) and the former-USSR/Russia (All-Russian Research Institute for Hydrometeorological Information (RIHMI)). This data exchange has its roots in a bilateral initiative known as the Agreement on Protection of the Environment (Tatusko 1990). CDIAC has partnered with NCDC and RIHMI since the early 1990s to help make former-USSR climate datasets available to the public. 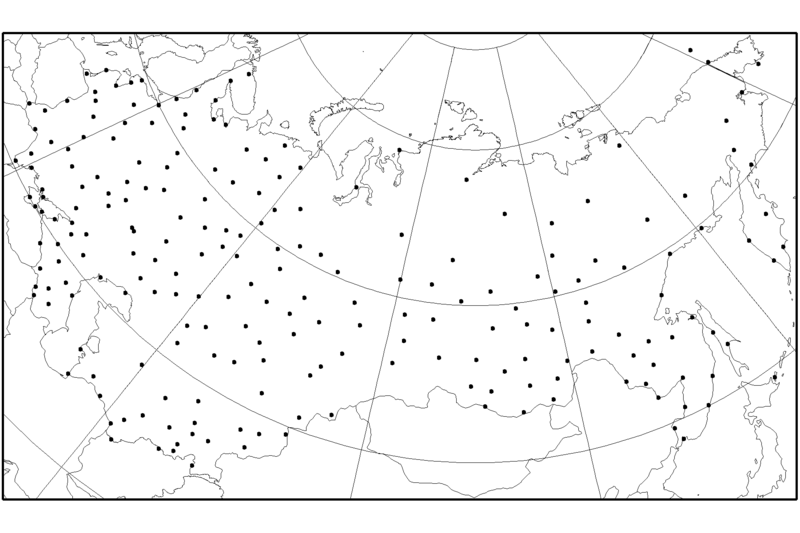 This dataset consists of daily temperature and precipitation measurements collected at 223 former-USSR stations over the period 1881-2001 (depending on station). It was compiled from digital and manuscript records archived at RIHMI in Obninsk, Russia. The prior version of the dataset extended through 1989 and was made available by CDIAC in 1993.. The dataset is expected to be updated again in 2009. In addition to more recent data, improvements will involve additional quality assurance checks and station metadata. The stations in this dataset are considered by RIHMI to comprise one of the best networks suitable for temperature and precipitation monitoring over the the former-USSR. Factors involved in choosing these 223 stations included length or record, amount of missing data, and achieving reasonably good geographic coverage. There are indeed many more stations with daily data over this part of the world, and hundreds more station records are available through NOAA's Global Historical Climatology Network - Daily (GHCND) database. The 223 stations comprising this database are included in GHCND, but different data processing, updating, and quality assurance methods/checks mean that the agreement between records will vary depending on the station. The relative quality and accuracy of the common station records in the two databases also cannot be easily assessed. As of this writing, most of the common stations contained in the GHCND have more recent records, but not necessarily records starting as early as the records available here. This database contains four variables: daily mean, minimum, and maximum temperature, and daily total precipitation (liquid equivalent). Temperature were taken three times a day from 1881-1935, four times a day from 1936-65, and eight times a day since 1966. Daily mean temperature is defined as the average of all observations for each calendar day. Daily maximum/minimum temperatures are derived from maximum/minimum thermometer measurements. See the measurement description file for further details. Daily precipitation totals are also available (to the nearest tenth of a millimeter) for each station. Throughout the record, daily precipitation is defined as the total amount of precipitation recorded during a 24-h period, snowfall being converted to a liquid total by melting the snow in the gauge. From 1936 on, rain gauges were checked several times each day; the cumulative total of all observations during a calendar day was presumably used as the daily total. Again, see the measurement description file for further details. The daily temperature and precipitation values are presented in 223 station files with names of the form "fXXXXX.dat", with "XXXXX" representing World Meteorological Organization (WMO) station numbers ranging in this database from 20674 to 38987. Each record of a file is 61 characters in length and contains data for one day. See more information in the data format file. A station inventory file and a station history file are available for the database. Neither of these files has changed since the prior version of the database was released and they may be read using the format information in the metadata format file. The stations comprising the network have remained the same, although siting details may have changed in some cases since 1989. Also, even though post-1989 data are now available, the station inventory file as yet gives no new information on how far beyond 1989 the updated data may extend; users can of course glean such information from examination of the actual data files. Updated details on station siting and length of data record should be available from the station inventory and history files in the next version of the database, expected in 2009. CITE AS: Razuvaev, V. N., E. G. Apasova, and R. A. Martuganov. 2008. Daily Temperature and Precipitation Data for 223 Former-USSR Stations. ORNL/CDIAC-56, NDP-040. Carbon Dioxide Information Analysis Center, Oak Ridge National Laboratory, U.S. Department of Energy, Oak Ridge, Tennessee. doi: 10.3334/CDIAC/cli.ndp040.